After going back to school and earning 3 medical degrees, Dr. Mark combined his firsthand experience of Oriental medicine with his university training to create the “Wiley method”... the one approach that finally gave him LASTING RELIEF from decades of searing pain. Hello, my name is Jesse Cannone, CFT, MFT, CPRS. As a certified fitness trainer, post-rehabilitation specialist and former pain sufferer, I’ve dedicated my entire career to researching and finding the safest, most reliable alternative pain solutions. If you have ANY form of chronic pain... whether it’s joint pain, muscle pain, tightness, stiffness, or full-blown arthritis this is great news. You see, my friend and colleague Dr. Mark Wiley understands what it’s like to live in constant pain. And he knows how desperate and frustrated you can get when you invest your time and money looking for answers... and STILL come up empty. Dr. Wiley has a very unique perspective on pain. He pushed through all the limitations you come up against when you look for answers. He moved beyond the fear and frustration... the drugs and surgery... and the so-called solutions that only provide temporary relief. With the “Wiley Method” there are no “partial victories.” His system works every time to relieve your pain, and even reverses damage you suffered years, or decades ago. In Dr. Wiley’s book Arthritis Reversed — which is yours FREE — you’ll discover ideas, insights and techniques your doctor has probably NEVER heard of... simple techniques you can use together to quickly and effectively eliminate your pain. How to melt away pain on contact with topical creams and oils from China and Southeast Asia that are completely unheard of here in the U.S.
Little known secrets that target and treat rheumatoid arthritis, osteoarthritis, and chronic joint pain with little-known herbs, nutrients and Traditional Chinese formulas. What NEVER to use when having an arthritis flare up… this common mistake makes your pain worse, and could even give you a heart attack. Get an immediate RUSH of relief with simple stretches that gently realign your bones and joints. Dr. Wiley is a master of holistic healing and creator of the self-directed wellness model, The Wiley Method. Using the same system he developed to help himself, Dr. Wiley has been helping his own patients beat pain — arthritis or otherwise — for over 15 years. He has studied directly with leading experts of both modern pain treatments and ancient holistic healing arts in the Philippines, Malaysia, Singapore, Taiwan, Japan and throughout Europe and the United States. Dr. Wiley apprenticed under Dr. Ong Kok Seng, the noted “bone setting” doctor of Chinese medicine and Dr. Robert Chu, world-famous acupuncturist and herbalist known for his cancer treatment and orthopedic bone and tendon treatments. Dr. Wiley is a best-selling author with over 500 articles and over a dozen books to his name. He's also a world-renowned martial art master and in-demand international seminar instructor in both natural health and martial arts. Dr. Wiley holds earned doctorates in both Oriental (OMD) and Alternative (PhD) medicine and a Masters (MSM) in Healthcare Management. As effective as these new solutions are, we’re just scratching the surface of Dr. Wiley’s pain-relieving knowledge base. There’s so much more. To really give you that shot at life-changing, lasting relief, Dr. Wiley shows you the deeper causes of your pain... which most doctors completely overlook. Which Foods “Trigger” Inflammation: Learn how to recognize and avoid the “trigger foods” that make your joints and muscles constantly ache, and discover how some “healthy” foods send waves of searing pain through your body. Which Foods “Snuff Out” Inflammation: These inflammation fighting foods help restore relaxed, pain-free joints. PLUS, the fat-burning foods that help you tackle the stubborn fat around your belly, hips and backside. How to Give Your Body a Diagnostic Check Up: To see where you may have too much of something (like excessive glucose, or too many diuretic beverages)... too little of something (like a deficiency of water, healthy fats, or thermogenic spices)... and where you’re experiencing “stagnation,” (like a buildup of toxins, or lactic acid). What Doctors, Chiropractors and Massage Therapists Miss: The impossibly tight, “contraction knots” that develop in muscle and tissue when an area of the body is stressed, “frozen,” injured or overworked... and how to release and relieve them with an almost unknown therapy designed specifically for people with arthritis and chronic pain. REVEALED: The 10 BIG Arthritis Mistakes Keeping You in Pain: Learn how these big mainstream-medicine blunders are sabotaging your efforts to get lasting relief. How to Balance and Realign Your Energy: Simple techniques you can do anytime, anywhere, that tap the power of China’s ancient tradition of Tai Chi, and QiGong. This “energy medicine” frees up energy, deepens your breathing, relieves stress, and chronic pain, and sends a stream of energy up and down your body you can actually FEEL. The Surprising Link Between Arthritis and Depression: How suffering through everyday pain can trigger full-blown depression, and the simple fix that brightens your mood, and tackles the gloominess you may be feeling on the inside. Why ALL “Approved Medications” for Arthritis Only Make Your Pain WORSE: The little-known “booby trap” hiding in popular NSAIDs and other over-the-counter pain relievers. There are more pain-relieving surprises in this 284-page book than I could ever tell you about in this short letter. You may not know this, but I’ve had Dr. Wiley on the medical advisory board of my company The Healthy Back Institute for years. I've personally relied on his vast knowledge and holistic approach to help our clients recover from their arthritis, back pain, and chronic pain quickly and completely. That's why the first time I heard his story a few years ago of how he healed himself from crippling arthritis I immediately asked him to write a book about it. It’s rare to meet a man who completely healed himself from non-stop pain by uncovering a system that outperforms ANYTHING mainstream medicine can throw at you. I actually pleaded with him to write this book. I asked him to think about people like YOU who are feeling stuck, frustrated and ready to pull their hair out because everything they try turns out to be a dead end... or at best, a partial, incomplete attempt and getting a few minutes of pain relief. And I know there are LOTS of people like YOU who are worn out, in constant pain, and at their wits end. Today, your search is over. I have the answers in my hand... and now I’m turning them over to YOU. There’s HOPE for Lasting Relief! I’ve personally heard from hundreds of our clients asking me how they can finally end their arthritis pain and get their lives back to normal. I’m certain there are thousands more I haven’t heard from yet. That’s why it’s critical you get this book in your hands RIGHT NOW. ~ Dr. Brett D. Cardonick, D.C. Cardonick Chiropractic, P.C. Of Healthy Back Institute… But Hurry, Copies are LIMITED! Many of Dr. Wiley’s patients spent years — even decades — of their lives and thousands of dollars on ineffective treatments before discovering his method of reversing arthritis. You’ve probably spent more than you care to admit on painkillers and other arthritis treatments that haven’t delivered lasting relief. It's time to stop wasting your time and money. When you accept my offer today, I’ll RUSH you an actual hold-in-your-hands copy of Arthritis Reversed — and I’ll even buy the book for you. 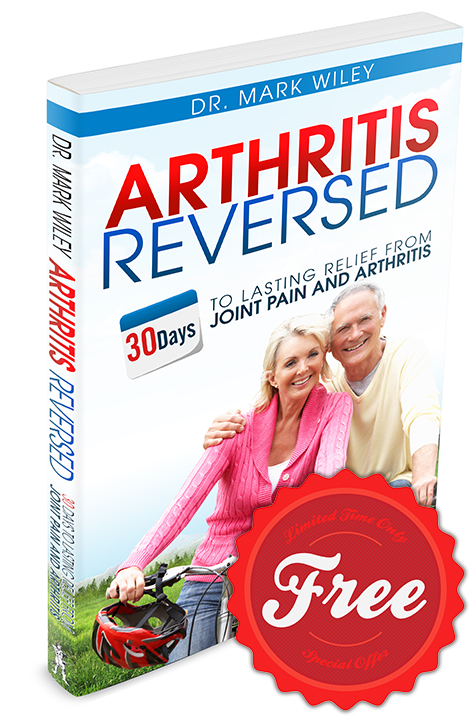 But I only have 500 FREE copies of Arthritis Reversed available to our friends from Healthy Back Institute like you. After that, you’ll pay the full retail price of $14.95. I Need to Hear from You Today! Today, I introduced you to Dr. Mark Wiley, my trusted friend and colleague who spent 15 years on a journey to uncover the most complete, most effective ways of silencing your chronic pain and reclaiming your active life. I showed you many of his groundbreaking techniques for getting BOTH immediate and long-lasting relief from your pain. Now the decision is yours. Or you can get a FREE copy of Dr. Wiley’s book Arthritis Reversed and start getting relief RIGHT NOW. But you need to act right away...when the FREE copies are gone, they’re GONE. So don’t wait another minute. Click the button below NOW to secure your FREE copy. Every time you work in your garden, play a round of golf, or enjoy a pain-free night out with your friends, you’ll be reminded you made the right decision. Just Pay Shipping & Handling $5.95 in the U.S.A.
P.S. — This book is so easy to use, you’ll have dozens of new options can use right away. And here’s something I didn’t tell you... Dr. Wiley included a super-easy 30-day action plan that makes it impossible to fail. He takes you through each step, and shows you EXACTLY what to do first, what to do second, and how to get lasting results based on your specific needs and situation. It’s a customized plan that leaves nothing to chance. So even if you thought your case was too complicated, or too “different” for something like this to work... I have great news. Everyone I know who uses Dr. Wiley’s method gets relief. I honestly don’t know a single person who’s missed out.